As we kick into the first of our weekly player interviews, we thought it seemed fitting to have a word with the Canterbury Ford Trophy Captain, Cole McConchie. Cole had his first class debut in 2012 at the age of 20. He has since developed into one of the most familiar figures in the squad. Handy with both bat and ball, as well as a natural leader who is very well respected by his team mates, it is not a surprise to see how much of an integral role Cole plays in the team. Favourite Cricketer of all time? Biggest comedian in the team? Most memorable moment playing for Canterbury? Winning the Ford Trophy 2016/2017. After all the drama that happened on that day, Fults (Peter Fulton) ripping out that 100. The whole day was a rollercoaster of emotions and just to clinch it in the final, over out there at Mainpower. Unreal. What does your off-season training look like? A lot of work in the gym and a lot of hours out at Lincoln indoors. I am lucky enough that I’m going to be heading over to the UK this winter for some cricket with Wimbledon, so it’s going to be a slightly different off-season for me this winter playing through, so really looking forward to that. A bit of a change from the grind in the gym and the indoor facilities. What do you see as the team’s biggest goals? We have a younger crop at the moment, so just learning and moving forward with each performance. I think there has been some really positive signs this season, but we haven’t really strung together a complete performance so far. I mean we have won a few games, we have pushed teams to the last over, and a lot of results could have gone our way, but I think the really positive sign is that there is actually a lot to improve on, which is very exciting moving forward. I think a strong growth mindset for this team, taking learnings from games and moving forward with them into the next game and then implementing that experience. Who do you see as the team’s biggest competition going into the Super Smash season? I think the Northern Knights have got to be up there as the defending champs, and they way that they played last season, they really set a tone early in the competition and kept on going the whole way through, they have got some quality players and I expect them to be really strong again this year so I pick them being the pace setters alongside us. Number one tip for players trying to improve their game? Resilience. Cricket has so many ups and downs, but training really hard and applying yourself in the game but knowing that cricket has its failures and being prepared to come back the next day and being prepared to bounce back again. I think it is a really mental game but having that strong inner resilience to keep bouncing back will hold you in good stead. Whether it happens the next day, next week or next month, if you are going to put in the hard work, things are going to happen for you. 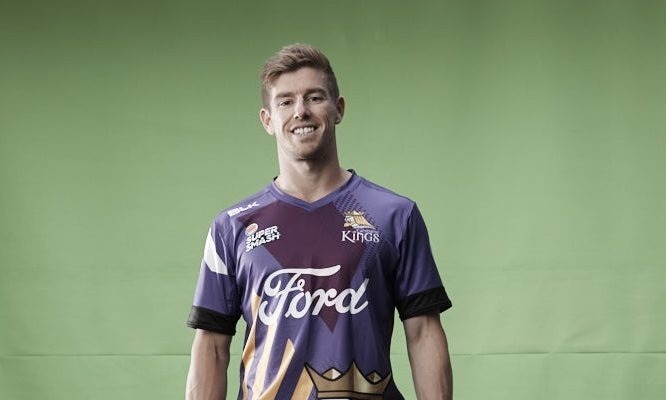 Cheers to Cole, and best of luck to him and the rest of the team as they prepare for their first round of the Burger King Super Smash, starting off their campaign against the Otago Volts at University Oval on December 23rd.